Although Albert Munyai remembers his grandfather carving, he taught himself to carve in 1985 under the guidance of his brother-in-law, Samuel Nethengwe. It was at this time that he carved his first spoons, bowls and walking sticks. He now works full-time as an artist. When the artist David Roussow (b.1959) befriended Munyai in 1986, he showed him images of Michelangelo’s sculptures. Munyai was inspired and his work developed further. In 1987, he was arrested, charged with carving wood without a permit, and fined R200. His sculptures were confiscated, and despite Roussow’s attempts to save them, they were all burned. Many of Munyai’s sculptures were purchased by Ditike, an outlet run by the Venda Development Corporation. His work is unusual, consisting often of fantastic or grotesque figures. Munyai is quoted as saying that he is ‘inspired by visions which act upon him with an intensity that he is unable to ignore and which can only be appeased through the process of carving’1. He is extraordinary also in his concern for conservation and often plants trees to replace those that he uses. Munyai’s subject matter varies and although he works mostly from imagination, he has made works that deal with labour, education, politics and local figures. The Sangoma (plate 281) in the Campbell Smith Collection is an instance of the latter. She is shown seated and in the moment of throwing the bones. Munyai generally uses hardwoods for large sculptures and lighter woods for utility items such as bowls and spoons, although his preference is for large artworks with added materials. Often this combination supports his elements of fantasy. Important in Munyai’s body of work are the large-scale works where different materials and different images have been combined to make a series of figurative musical instruments, primarily mbira (marimbas) and drums. An example, the Marimba cow (plate 282) is in the Campbell Smith Collection. Cattle play a significant role in African cosmology but the fact that the subject is female is important for Munyai for it represents, among its many other purposes, the ability to reproduce. 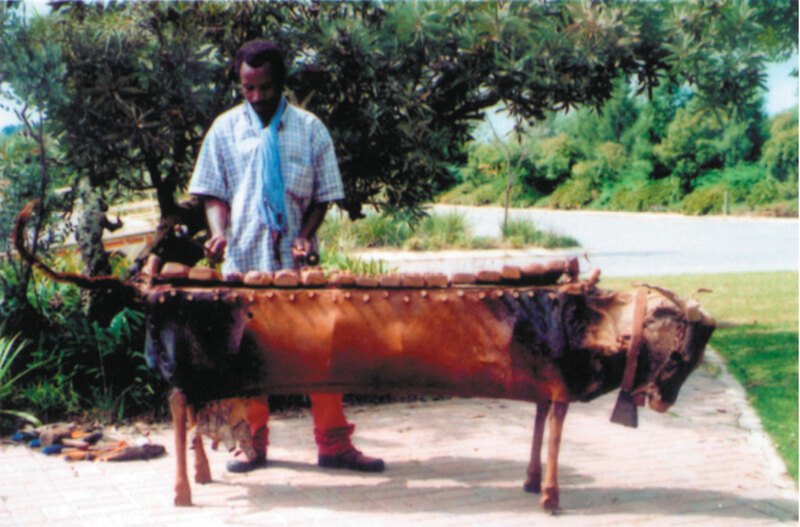 Munyai has used the hide of an animal to literally represent the body of the animal that acts, at the same time, as the sound box for the instrument. He has enriched and elaborated the whole by adding many carved elements to the keyboard. It is thus simultaneously a musical instrument and a sculpture. Michael Markovitz. 1987. ‘Not to be neglected – Albert Munyai’, Spark, no. 2. p. 26. Born c.1956-1958, Limpopo Province. Lives and works in Tengwe (Tshandama), Limpopo Province. Exhibitions 1989: Images of Wood, Johannesburg Art Gallery. 1991: Cape Town Triennale, Iziko South African National Gallery, Cape Town, toured nationally. 1995: Johannesburg Africus Biennale. 1998: Market Theatre Art Gallery, Johannesburg; Contemporary Art From New South Africa: Dreams and clouds, Kulturhuset, Stockholm, Sweden. 1999: Market Theatre Art Gallery, Johannesburg; Sanlam Art Gallery, Bellville, Cape Town; Sandton Convention Centre, Johannesburg. 2000: Mukondeni African Art Gallery, Johannesburg. 2001: Mukondeni African Art Gallery, Johannesburg. 2002: Daimler Chrysler Award for South African Sculpture. 2002: Exhibition of the nominees, Johannesburg Art Gallery. Collections Tatham Art Gallery, Pietermaritzburg; Sanlam Art Collection, Bellville; University of Venda; Johannesburg Art Gallery; The Mahlakasela Collection, Johannesburg. Awards 1993: Runner up in Bertrams’ VO Art of Africa Award Competition: Indigenous People. Photograph of Albert Munyai. Courtesy of Neil van Kraaienberg, Gallery 181, Johannesburg.